Our Perfectly Imperfect Life: —Shh... | Sarcastic Mug + Recipe! —Shh... | Sarcastic Mug + Recipe! This mug is so funny! My husband loves it. This 11 oz mug is great for bride and groom gifts, Christmas, thinking-of-you gifts, Birthdays, you name it....this mug is perfect for anyone who loves a good laugh! Keep reading for a yummy hot chocolate recipe! Mix all ingredients together and store in an airtight container. Run mix through a blender to make it a finer powder to better mix all ingredients together. your desk or in the break room. Share a smile with anyone on your gift list, whether they’re a boss, co-worker, employee, friend, family member, significant other, or anyone else. - Lasting Quality: High-quality, smooth ceramic stoneware resists scratches and lasts a long time. The custom imprint is permanent and won’t lose its luster or fade. Your stoneware ceramic mug can be used with either hand since the SHH... NEVERMIND, TIME TO POOP design is printed on two sides. Good for Any Occasion; With an 11-ounce capacity, these mugs hold plenty of liquid and make great gifts for all of your special occasions: anniversaries, bachelor and bachelorette parties, birthdays. - Safe for the Microwave and Dishwasher: Use your mug again and again in the microwave. Wash it in the dishwasher after every use and still never worry about the design fading away or peeling over time. Cold and hot temperatures will not affect the high quality of your ceramic stoneware mug, so you’ll feel confident to use it every day. 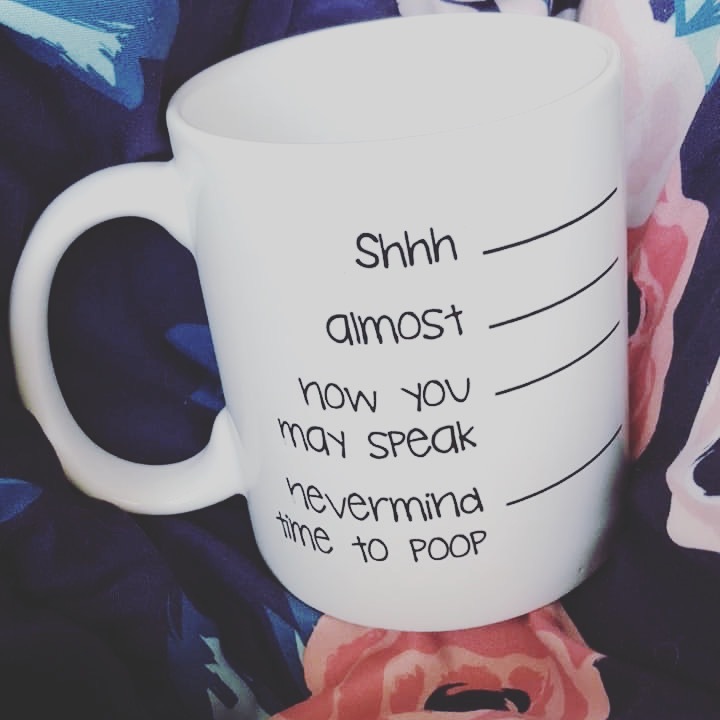 - Fun Way to Break the Ice: Your new ceramic coffee cup displays SHH... NEVERMIND, TIME TO POOP on both sides so you can both laugh over your coffee or tea in the morning. The double-sided design makes an ideal gift for a new bride and groom or a wonderful housewarming present. Surprise your spouse with this cute, thoughtful gift for your anniversary or any time you want to show you care.